"Should I Spray or Squeegee my Driveway?" Sealcoating your asphalt is very similar to painting your room. A paint brush is used for all of the areas that require extra attention to detail, such as the trim and edges. A brush is almost never used for the actual wall itself. This isn't because the finished product will be compromised, this is because it would simply be ineffecient. If you hire a painting contractor, and tell him you only want him to use a paint brush to paint your room, you will be charged a premium price. This isn't because the paint brush will leave behind more material, this is because it takes much longer time to achieve the same results as using a more effecient application method. It is a common misconception that the Squeegee method costs more because you are using more material. This is purely a marketing/sales scheme that is used by companies that are trying to get more money for less material. The truth of the matter is that applying with a squeegee will almost always leave behind less material than spraying. The truth of why the squegee method costs more, is because it takes much longer to apply less material. This leaves the impression to the homeowner that because it took longer, there must be more material and a better coating. This is simply not true. There are both pro's and con's to each solution. The truth of the matter is that it all comes down to the company you decide to use, and what material that company uses. The material we use is Coal Tar Emulsion, which is a natural product that is tar based and is produced naturally from Coal. This material when cured creates a hard barrier on your asphalt to protect it from the elements that cause fading and damage over time. We firmly beleive that with our material, the spray method is the best application method. There are multiple contributing factors that have led us to this conclusion. The most important being that with the spray unit that we use, you can have full control of how much material is being applied. With the squeegee method, it is impossible to control this. With the spray method we have full control of the material which allows us to apply thicker coats where it is more coarse and allows us to apply an even amount of material to the whole driveway, and not just certain spots. Be aware of the "fly by night" Sealcoating companies that will try to convince you that squeegee/brush method is the absolute best method. Most of the time these "companies" are only trying to sell this method because they don't have or can't afford the proper machinery and equiptment to properly spray apply the material. These "companies" also tend to use filler and additives to their mixture to make the driveway look good, but actually have no protective value. 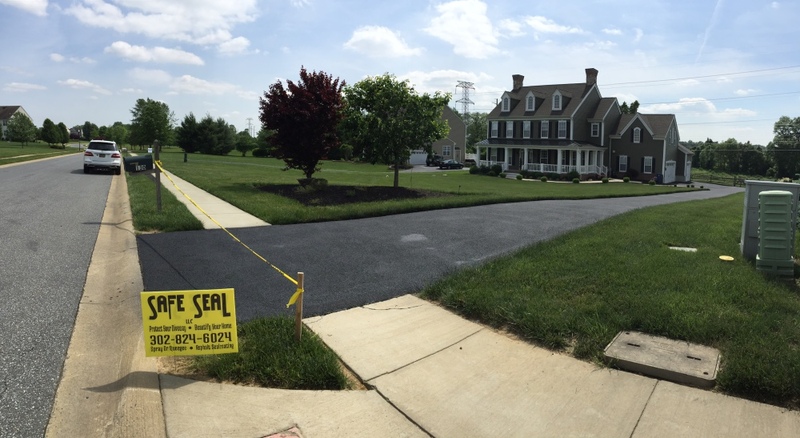 Our main goal at Safe Seal LLC is to protect your driveway from future issues/damages. We sealcoat to protect your driveway, the beautiful appearance that it gives is just an additional benefit. Even though we stand by the spray method being the best solution for Coal Tar Emulsion, we do provide the option to Squeegee. We do this because we want retain the ability to provide our customers with the service that they want.